As a huge proponent of the blended classroom, I like to mix things up. Last week, I wrote about super-quick low-tech reviews. This week, the exam review in my classroom is all about that tech. Just like the next person, I have my favorites that I tend to overuse, and I've written about them on several occasions (QuizletLive, Kahoot!, edpuzzle, learning apps, Google Apps, etc.). But when you hear the Kahoot! music coming from the room across the hall and your students are mindlessly singing along, that might be a sign that it's time to throw something new their way. And when you have students who get fidgety after 10 minutes in their seats, it's imperative to try something new. So this week, I'm going to write about one really cool and simple tech review that will get your students out of their seats and engaged. This one is truly blended, folks. I try to get students up and moving whenever I can. It's great for kinesthetic learners and, truly, it's good to throw a curve ball at everybody every now and then. 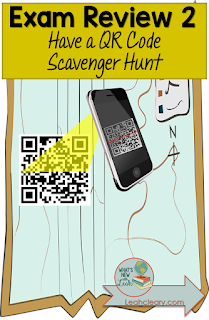 Simply visit QR Code Treasure Hunt from classtools.net (there's lots of fun stuff here). You will enter questions and answers that you want your students to review. Only instead of printing out a boring worksheet, this site generates QR Codes for you--they don't lead to a website--they pull up the text of the question. So, you can print the QR Codes, scatter them around your room or the school, and challenge students to find them, scan them, and answer them in a set amount of time. I know, I know, QR Codes are so 2015, but you have simply got to give this one a try. Students are racing to answer questions--finding that QR Code and scanning it adds that treasure hunt element that makes it fun. 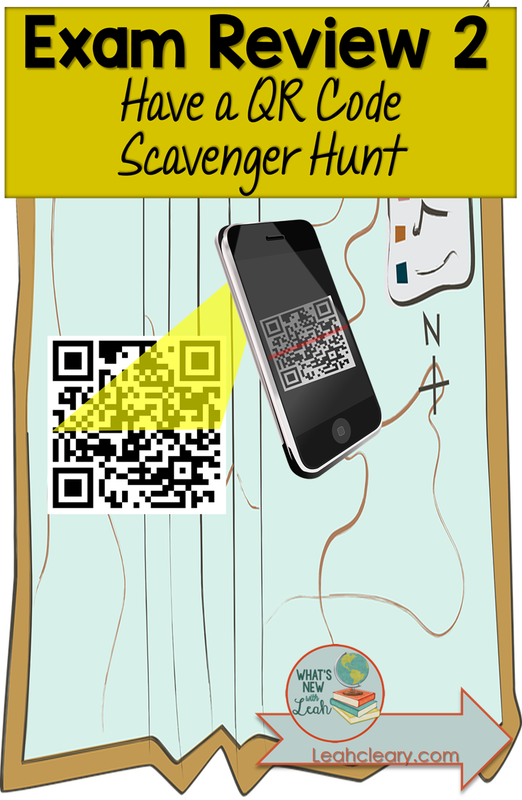 I'm going to show you how to create one of these scavenger hunts, how to implement one in your classroom, and, finally, how to trouble shoot potential issues (do not skip this part--the new IPhone update can cause a potential issue if you don't prepare). What do you think? This is the boring study guide that's not so boring--a wonderful mix of technology, movement, and challenge. If you give it a try, be sure to let me know how it goes in the comments below. And check back in next week--I plan to discuss one more exam review that has been a life-saver for my exhausted students. This is great full blog i like this type blog. Deferentially this blog have this quality big cost, special effects, thank for sharing this blog. Refad more: college paper writing service. Thanks for this post.Love to see this from you.Happy to get these kind of information. Looks s o good and happy for reading.